The new episode is produced for the first time by Jo Wright, former drama chief at the BBC, LWT and Talkback Thames, whose many credits include Lovejoy, 55 Degrees North, Doctor Who, Othello, Coup! and The Sculptress. Says Jo: "I was hugely flattered when I was offered the role of producer on MIDSOMER MURDERS and I'm very excited to be working with Neil Dudgeon and Jason Hughes. The series is extraordinarily popular, and my goal is to keep what is absolutely great about it, while bringing a fresh eye to the show and introducing some new themes and ideas. "MIDSOMER MURDERS has done so well for 14 years and as soon as you mention it to people the reaction is amazing. I have worked on various dramas over the years but you don't get that Midsomer reaction. I am very proud to be a part of it." One of Jo's plans is to develop the partnership between Barnaby and Jones. "I really like their relationship, there is definitely a bit of a bromance going on. They're a bit Holmes and Watson, and there is a great chemistry between then, both on and off set. Neil and Jason are both such great dramatic and comic actors and their timing is exquisite. So I hope to explore that a bit more and in episode two, we see that Jones does indeed have a personal life! Fans of the series may notice some other subtle changes with Jo at the helm. "I am bringing some new writers and directors into the established team, like Alex Pillai whom I worked with on Silent Witness and who has been doing Merlin recently. He's a huge fan of the show, and was keen to be involved in the first film of the new series. "I'm also bringing in themes to some of the episodes, like this one, which is all about war in relationships. In a later episode we have a story where we discover a famous actress from the horror films of the sixties lives in a Midsomer village." The Dark Rider was filmed partly at Knebworth House, including a Civil War re-enactment made with the help of historical event organisers The Sealed Knot. Explains Jo: "We have about 200 members of the Sealed Knot as extras. They are volunteers but came and camped beforehand and threw themselves into it wholeheartedly. We had four cameras filming at Knebworth with cannons and muskets firing. It was very exciting." Some of Jo's other ideas can be seen behind the scenes. "I have set up a Facebook page which has nearly 80,000 fans already. I want to give people more access to the show, with lots of pictures, exclusive interviews and information. We're also having a 'Sykes Cam', where a camera is put in Sykes the dog's collar showing a day in his life. "It's all about making it more fun and trying to bring it up-to-date. The reaction around the world has been amazing in such a short time and it's great to have a way to unite all these Midsomer Murders fans." Neil Dudgeon is delighted with viewers' response to his role as DCI John Barnaby. "The feedback to my character has all been very positive and it's great that people have taken to the new Barnaby so well. There is a great strength in the series and it's not so much about me, but appreciating and understanding how to keep the audience happy. "I am excited to have been entrusted with this great job and I hope people will continue to enjoy it under my stewardship. Hopefully it will go on for a long time yet as there is all that beautiful English countryside to explore and tackle crime in!" He adds: "I think the show occupies an area that doesn't exist anywhere else in television, but, like any good series, Midsomer Murders can't stand still. In my personal opinion, it's good to move with the times and make subtle changes, even if Midsomer is in a time of its own. That time bubble, together with the wonderful locations, eccentric characters, pretty villages and a couple of murders along the way, with appearances from some great actors from stage or soaps, really makes the drama what it is." Although Neil's character is a cousin of the DCI Barnaby played by John Nettles, they are very different detectives. "John Barnaby has a degree in psychology and his approach to his work comes from his interest in criminals and why they do what they do. He plays his cards close to his chest and adapts his persona to get results, even if it means he has to look weak or silly. He is also quite direct and has a likeable black sense of humour, which helps him get through the darker moments. I would describe him as bluff and ironic. "John has worked in Brighton so he's more metropolitan in outlook and has seen a bit of modern, urban policing. Moving to the countryside is an eye-opener for him, but in a good way because he's interested in people. Murderous, eccentric people are populating the rural villages and committing bizarre murders with great historical stories to them. I think he's like the town mouse moving to the country." The arrival of John and his wife Sarah (played by Fiona Dolman) also brings a slightly younger feel to the series. "There is more sexual chemistry flying around as John and his beautiful wife have a vibrant relationship. She has an important job as a head teacher and their relationship is one of equals. We also have our hilarious and charming dog Sykes. "The community of Midsomer may have been a little guarded and cool towards them at first, but once they were accepted, they were sucked deeply in quite quickly. I feel that Barnaby is now well embedded in Midsomer life. The villagers have taken me, the wife and the dog to their hearts, so we are now a fixture!" Neil has particular enjoyed working with Barnaby's sidekick, Detective Sergeant Ben Jones, played by Jason Hughes. "Jason and I knew each other slightly before we started, so that was a great help. I think he is brilliant in the part; he has a lot of charm and we have a nice time working together. "My Barnaby is closer in age to Jones, which brings a new dynamic. Their similarity in age heightens the differences between them and their approach to crime. Jones is more methodical and by the book, while Barnaby is more instinctive and mercurial. And I hope that the friendship we have off-screen shows on-screen to some extent in the bantering, playful relationship that has developed between them." Neil has long been a fan of the whodunit genre. "I enjoy reading crime novels, I like Agatha Christie and Sherlock Holmes and I recently read The Suspicions of Mr Whicher. I also try and see what other people are doing in the crime area on television and I like watching series like The Wire and NYPD Blue. Crime stories are very fertile in any medium - you have the whodunit quiz element, alongside all the relationship storylines." He adds: "I think the whodunit angle is one of the main reasons for the success of MIDSOMER MURDERS. It's a proper two-hour show that you can get immersed in because there is time to look at all the suspicious characters, red herrings and all. "The locations are vital, seeing all the beautiful English countryside, vast stately homes and sweet little cottages. Episodes have characters ranging from poachers to lords and ladies, and the humour is always trickling under the surface. "It's also nice that each episode has a slightly independent feel, a different director and different writer, and a cast of 15-20 people on each one who bring new life to the film. Some episodes are very dark and macabre, while others can be relatively light and quirky. I like the variety and the change that each film brings." Neil stars as Jim Riley in Life of Riley and his other roles include The Mrs Bradley Mysteries, The Gift, The Nativity, Common as Muck, The Street, Messiah, Roman's Empire, Out of the Blue, Resnick, Sorted and the award-winning feature film Son of Rambow. His theatre credits include Road and Blasted at the Royal Court, and Closer at the National. When he's not working, Neil enjoys spending time with his family and indulging his hobbies. "My passion now is the arts and I like going to galleries and exhibitions. I still enjoy football; I have a season ticket at Fulham and get there when I can. I also go to the gym when I get a bit of a late start on set, but then I undo all the good work when I arrive and have a bacon butty!" Jason Hughes can see Barnaby and Jones becoming a new Sherlock Holmes and Dr Watson. "Since the arrival of Neil Dudgeon as DCI John Barnaby, the role of Jones has definitely changed. He's the bridge from the old to the new and that was fortunate for me because it gave me more to work on. "I think the main reason why the relationship works is that there is a healthy tension between the two characters. That gentle chiding gives us an extra dynamic. Ultimately, though, there is a mutual respect between them. They both approach their jobs in different ways which benefits the investigation. They are coming closer to the Holmes and Watson set-up whereas before it was a young Jones being nurtured and taught by an older, senior officer. "With the new Barnaby, their relationship is more equal. Jones is not tied at the waist to someone else; he can go off and work independently then come back and show the boss what he's found out." Jones took a bit of time adjusting to his new boss. Explains Jason: "Jones thought it would be difficult for the new Barnaby but he is the one who's struggled. He is used to the old way of doing things; the procedural technique based on his old boss. "The new Barnaby has come with a fresh, new approach, an excellent track record in solving cases - and a psychology degree. Jones doesn't like to admit it but he gets quite intimidated at first. Jones is rigid in his approach to work, whereas the new Barnaby is much more flexible and progressive. But now he is learning to work with his boss in a productive way. "It's a nice dichotomy and I've loved it as an actor, because it's given me a new set of emotional tasks. You see a bit more of Jones and find out what makes him tick," adds Jason. As well as the character development, Jason has also enjoyed working closely with Neil. "It has been an absolute joy because Neil is a lovely guy, a really kind man who works incredibly hard. He tries his utmost all the time and it's been great to watch him get stuck into the role and explore it. "I knew Neil previously from the theatre and we had both worked at the Royal Court. We were going to do a play where we would have both been policemen but it didn't work out. I'm glad we got to do it eventually!" Away from Midsomer Murders, Jason is busy developing a feature film made up of eight interconnecting short films, through his company Portmanteau. "The idea is loosely based on yoga's Eight Steps of Patanjali and at the end there is a final film which ties all the characters together. I'm using the theme to retell narratives in a contemporary and sometimes oblique way. The plan is to film in different countries, but using the same budget and equipment in each. "We are a year away from filming and it's been an incredible learning curve but I'm really excited about working with the writers to create interesting and exciting scripts to take the audience through these different worlds." When he's not working, Jason is a devoted family man. He lives in Brighton with his wife Natasha and three children, Molly, Max and baby Carys. "I am a hands-on dad, it's my life. When I finish filming I come home and cook, clean, shop and look after the children. I don't live a rock and roll lifestyle!" Jason's other credits include This Life, Plain Jane, The Flint Street Nativity, Phoenix Blue, Killing Me Softly, Mine All Mine, Waking The Dead, Coming Up and the forthcoming Dante's Daemon. Playing the role of Sarah Barnaby in has been an education for actress Fiona Dolman. "Sarah Barnaby is the headmistress of Causton Comprehensive School and the scenes in the school were a real learning curve. I had forgotten how tall sixth-formers are! "In my first episode we saw her in the school having to deal with some disapproving teachers, but when you see her again walking down the corridors, the children are opening doors for her, so the respect has been commanded. "Sarah seems to have a calm sense of authority. She is not the type to be pushed around but she is diplomatic; she doesn't walk over people or impose her will. Her best way out of a difficult situation is for the confrontational person to walk away and feel they have come out of it well." Adds Fiona: "Her way of schooling is similar. She refers to the boys as young gentlemen and knows all the children by name. She wants to prepare young people for the real world and she's very in touch - she has a modern approach backed up by old fashioned values." 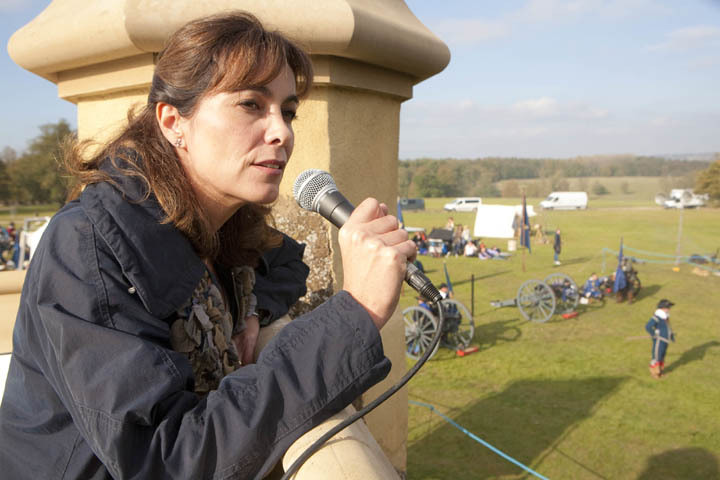 Fiona joins in the action in The Dark Rider when Sarah Barnaby attempts to provide the commentary at the Civil War re-enactment. "It's been lovely to branch out and have a few scenes with the guest actors, rather than just being in the Barnaby home all the time. There is such an amazing calibre of actors in the series who come in as guests. It's a joy to go to each new read-through and meet whoever is there." Another of the highlights for Fiona is working closely with Neil Dudgeon as her husband, DCI John Barnaby. "I feel the relationship between Neil and me has gone from strength to strength, and it was very easy from day one. The chemistry was there and I really respect him as an actor. The Barnabys have a normal relationship which potentially could be dull, but it's sparky and naughty instead. They share a fundamental set of values. "Barnaby's not angst ridden and doesn't come home and hit the bottle, but helps her in the kitchen and if I'm working, he'll do the cooking. It's an equal relationship and it mirrors what a lot of working couples do. I like the fact that they get on so well and both love their jobs, and yet respect each other's space." Adds Fiona: "Neil is great fun and I love working with him. I love sitting with him when he's being interviewed as he has a very dry sense of humour and brings real energy to the character. Offset we get on well too, although he is at work day in, day out, while I am only in for a couple of days at a time." Sykes the dog completes the Barnaby family. "Sykes is the consummate professional; he hits the mark and does the right thing, as long as there is a bit of sausage at the end. He knows us better now and is probably a bit more affectionate with us. I think he knows that we are his screen mum and dad." Fiona's credits include Heartbeat, The Royal Today, Holby City, Doctors, New Tricks, Coronation Street, Paradox, Waterloo Road and the feature film Ways to Live Forever. One of the new arrivals in the series is well used to fame and recognition. Sykes the dog was cast in March this year, after attracting the attention of the producers. He is a dog actor from Clinton, Oxfordshire, and is best known in the UK for his appearance as Harvey in the 'Thinkbox' television commercial, but he has also appeared in several Hollywood blockbusters. Originally found roaming as a stray in 2004, his owner is animal trainer and stunt dog specialist Gill Raddings. The police were going to place him in kennels, so Raddings took him in herself. Gill runs Action Stunt Dogs and Animals, and other dogs sharing her home with Sykes include Kyte, the Belgian Shepherd who portrayed Wellard in EastEnders. Although a cross-breed, Gill believes that Sykes has some Parson Russell Terrier stock in him, due to his long legs. Sykes joined the series alongside Neil Dudgeon, and was introduced when John Barnaby is seen talking about the cases to him, while he is waiting for his wife Sarah to move jobs to join him in Midsomer. Neil loves working with Sykes, although he was worried that the terrier would upstage him. He says: "You have to be careful, as he is a bit of a scene stealer, he knows every trick in the book, and he will do anything for a sausage." Owner and trainer Gill Raddings says she gives her prize performing pooch food as a treat when he performs a skill. "He does it because he's trained to do it, but obviously you reward the dog for doing it correctly". The producers decided to keep his name as Sykes as he responded so well to it, and it seemed to fit in well in Midsomer country. He is normally seen in scenes around the Barnaby home, although he has also been seen out walking with Barnaby and Sarah as well as visiting a prospective dog-minder. In the Everybody Needs a Harvey advert, Sykes is seen ironing, cooking, mowing the lawn, and driving the children to school. By the end of 2010 the advert had more than a million hits on YouTube, and over 11,000 followers on Facebook. Films that Sykes has appeared in include Sweeney Todd: The Demon Barber of Fleet Street, The Other Boleyn Girl, Young Victoria, The Duchess, Pirates of the Caribbean - The Curse of the Black Pearl, The Wolfman, and Clash of the Titans. His other TV roles include Casualty and Doc Martin. Tamzin Malleson hoped to bring a touch of glamour to her new role investigating dead bodies in MIDSOMER MURDERS - but after five episodes she is still waiting. "When I got the part of Kate, I went shopping with the costume designer in Oxford Street and we bought silk shirts, a beautifully cut navy suit and a really good pair of high heels. But I am still wearing scrubs which look like a baby blue romper suit and a face mask - and I don't think I'll ever get to wear those high heels. "Because I am always at the murder scene or the mortuary, I am in my scrubs. They are like pyjamas to wear, so there is certainly no glamour. In my first scene, I even had a cloud of flies buzzing around my head because they were attracted to the blue romper suit!" Tamzin plays pathologist Dr Kate Crawford, who has her work cut out dealing with the countryside's high death toll. "Kate is unmarried and absolutely focused on her career, and coming to Midsomer is a promotion for her. She's a professor and a doctor, so she's well trained - a bright spark. "She gets on well with Barnaby and Jones and stands her ground. Barnaby respects her knowledge and, although the relationship is still at that very early stage, it's developing. Neil Dudgeon is very good because you think you are getting a straight copper performance, but he is great at suggesting humour or making things slightly tongue-in-cheek. It's perfectly pitched. And Jason has great enthusiasm, they're a total delight." Tamzin was thrilled to get a regular role in the series. "You have all these incredible actors playing barking parts, so the regulars have to be fairly straight to give the balance. I think there is mutual respect between Kate and the detectives, it's an exchange of information and my role is to fill in the bits that the viewers can't see. I examine the bodies and offer my opinion, but within that there's space for a bit of banter." Tamzin had plenty of experience to draw on from her other acting roles. "I was a senior house officer in Always & Everyone and in Bodies I played a specialist registrar in obstetrics and gynaecology. That was incredibly detailed because the writer was a doctor himself. So for Midsomer it's a bit easier, although the murder weapons are bizarre things like African artefacts!" Adds Tamzin: "I am slightly squeamish about blood and needles in real life but I am fine with pretend. And I loved the scenes in the morgue, it was so fascinating." Tamzin lives in the Gloucestershire countryside with her partner, actor Keith Allen and their daughter Teddie. When she's not working she enjoys painting and the family also have a smallholding with pigs and grow their own vegetables. Her credits include Teachers, Bodies, Dangerfield, Always & Everyone, Agatha Christie's Poirot, The Vice, Boy Meets Girl and forthcoming feature film 7lives.